Recently, after a couple of months of 100-hour weeks, I decided it was time to take Irene on a vacation. My frequent business trips afford me an opportunity to see more of the world than her (however you read that, it's correct), and she frequently expresses disappointment that I've been to so many cool places without her. Thus, I organized a week-long road trip that would cover a bunch of these locations: San Diego, the Mojave Desert, Las Vegas, the Hoover Dam, and the Grand Canyon. 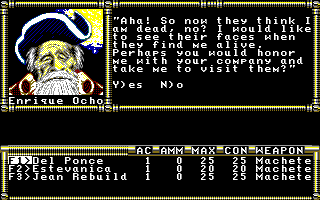 You can probably imagine where this is going for a CRPG addict. I haven't been to Hoover Dam since 2007, but I was at "Hoover Dam" fairly recently. While Irene was preoccupied trying to learn about the history of the dam in "reality," I was running around saying things like, "Look! That's the abutment where I sniped an assassin and saved the president of the NCR!" and "Did you know this dam can withstand the damage from a mini-nuke and an unlimited number of salvos from a missile launcher?!" I'm sure I'm not the only one. My guess is the Bureau of Reclamation Police (in charge of Hoover Dam security) has received training and literature about this ("Note: Caesar's Legion is not a real terrorist organization and poses no threat to the Dam") so they don't end up handcuffing people talking in a loud voice about blowing up the president's chopper. This continued, I'm ashamed to say, for the duration of the trip (e.g., "Primm! I saved this city from escaped convicts! "), but not all references were to New Vegas. I recounted getting carried helplessly down the Colorado River in Wasteland, and I had to be talked out of a side-trip to Needles, Arizona ("We have to find the Temple of Blood!"). Did you know that Needles was a real place? I didn't. I thought the developers of Wasteland made it up. "Quartz" is also a real place, sort of: there's a city called Quartzsite in about the right location. I was almost surprised I didn't see a sign for "Guardians' Citadel: Exit 50." In short, the entire trip put me in a serious Wasteland/Fallout mood, and of course I couldn't play either because I was doing stupid boring stuff like standing on the edge of a huge crevice for hours. When I got my hands on my computer again, I reasoned that while I'd already played Wasteland and I couldn't blog about New Vegas for years, I could at least jump Fountain of Dreams up the queue a bit. After all, it's kind of a sequel to Wasteland, and Hard Nova was giving me serious player's block. I already knew that Fountain of Dreams has a poor reputation among Wasteland fans, with one recent commenter calling it the "worst RPG I have ever played." From what I understand, although Electronic Arts intended it as a sequel to Wasteland, it was developed in-house at EA, without the involvement of Interplay or any of Wasteland's creators and programmers. Lacking the code from the original, they re-created it rather than adapting it. The setting moves from the southwest to south Florida, the back story is much goofier, and the game is (reportedly) much smaller and shorter. No connection to Wasteland is made in the game's documentation and manuals, and none of the factions or plot elements of the previous game seem to appear. As we'll cover in the final posting, Computer Gaming World eventually included Fountain on a list of the worst RPGs of all time. Given all of this, I found myself, to my surprise, not hating it. If you strip away its Wasteland baggage and mentally block some elements of the story and setting, it becomes a perfectly serviceable little RPG that does a reasonably good job recreating Wasteland's engine and adapts some of the previous game's best elements. Oh, it's not perfect, but when I was playing yesterday and had to stop and get some work done, I didn't want to stop. That's better than a lot of games. There are a fair number of somewhat-interesting NPCs to whom you can pose various questions or, with the right items or charisma, hire in your party. You first have to get past the staggeringly awful backstory, in which a nuclear war somehow causes Florida to break free of the continent south of Daytona Beach and go drifting off on its own, as if the land we live on is just floating on top of the ocean or something. To top it off, the denizens have erected a wall ("Mickey's Wall") around the entire island to keep out mutants from the mainland, a device which limits the size of the game world enough on its own and renders the stupid "Florida is now an island" element superfluous. The outdoor game map takes up a miniscule area of about 20 x 20 squares, containing Miami, the player's home, the Everglades, and...sigh...we have to confront this eventually...the Killer Clown Kollege. If they were going to spell "college" with a "k," I have no idea why they didn't do the same for "clown." Someone thought this was a good idea. The Miami Police, which by itself isn't silly, until you see that its co-chiefs are named "Tockett and Crubbs." 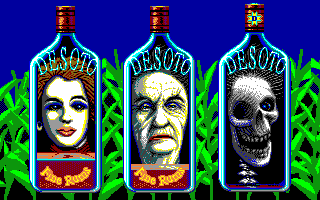 The DeSoto Family, which oversees the illegal manufacture and trafficking of rum, rumored to contain the Water of Dreams, a curative liquid that prevents mutation. One wonders who is keeping liquor illegal in this post-apocalyptic wasteland. The game is fond of these silly cut screens. The Obeah Orders, or "OhOhs," a cult of voodo-using Rastafarians. "TomTom," a leader of the Obeah Orders. The Bahia Mafia, remnants of traditional Miami organized crime. The Beach-combers, mercenary surfer dudes rumored to be behind the kidnapping and lynching of OhOhs. 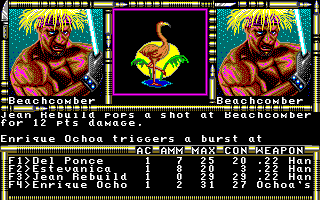 Fighting a group of Beachcombers. The PCs come from a small compound northwest of Miami. Other than their parents are dead and they have a younger NPC brother named Junior, the manual declines to assign a specific backstory to them or motivation behind their quest. Mutations are reportedly getting worse, mutated animals more frequent and ferocious, and Dream Water is getting scarcer. The PCs set off from the compound to Miami, intent on helping clean up the city and find the fabled Fountain of Dreams. Picking up some information about the Fountain from an NPC. 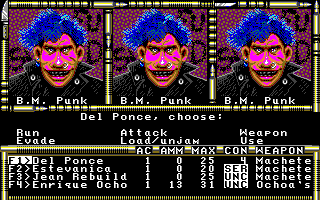 The player begins by creating three characters. There are slots for five, but two have to be filled by NPCs that you find along the way. The manual and game screen don't bother to mention this at all, so I started with the assumption that I could create five characters and put one in each of the game's five classes: survivalist, vigilante, hood, medic, and mechanic. (Good job on the creators' part: these five professions are the most predominant in contemporary south Florida, Armageddon notwithstanding.) By the time I found out I was wrong, I ran into one of the game's quirks: aside from the opening screen, there's no way to create new characters. There's also no way to start the game anew. You have to delete it and reinstall it on your hard drive. This must have been absolutely infuriating back when the game was new. During character creation, everyone starts with the same abilities in strength, dexterity, aptitude, charisma, willpower, and IQ. You add to these values from a fixed pool of bonus points. Each class also comes with a fixed selection of active skills and passive skills. Active skills are those that you can employ directly, like mechanics, lockpicking, medicine, and bomb disarming; passive skills affect things automatically in the background and include things like weapon skills, stealth, perception, and evasion. After creation, the only way to acquire new skills is to read skill books, except for the case of "evasion," which popped up for all my characters as they dodged enemy attacks. Acquiring a new skill from a book. 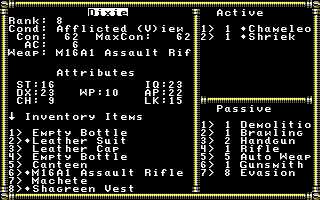 Nothing is randomized during character creation except for the character's initial hit point value. The manual tells you the range of hit points for each class, and you can roll new values by simply hitting the class's associated number over and over, so within a few rolls you can get max value and the whole mechanic ends up being kind of stupid. Once I realized I could only make three characters, I re-installed and started over, creating a hood, mechanic, and medic. I realized this party would be a bit under-powered in weapon skills, but I tend to prize skills used for solving puzzles over those used in battle. I'd rather reload combat a few times than be up against a locked door with no way to open it. Later, I found out that you can quickly find NPCs with skills to fill the gaps, so the choices during character creation don't matter as much as I feared. Using the "Lockpick" skill to get past a door. The party starts in the middle of the player's compound. Nearby NPCs--the player's younger brother, Junior; a neighbor named Ignatz Krebs; a local doctor--impart some advice, and the doctor offers free healing. 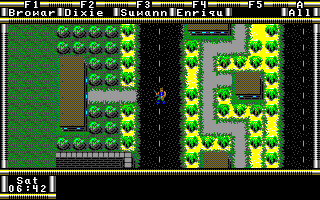 But the game really begins when the player exits the compound and makes it a few steps southeast to Miami. Starting out in the compound. In between, there's a danger of Killer Clown attacks, which is a death sentence for low-level parties. The Clowns pop up randomly in the wilderness. Even if you somehow escape them before they cut you down, their icons remain on the screen, and they attack again if you get within five squares. It's an awful game mechanic that serves to keep you confined to Miami during the first part of the game, save the occasional sprint back to the compound to get free healing. The starting compound is just to my northwest; Miami just to my south..
Miami is quite small, just like the outer world, consisting of three major north/south streets. 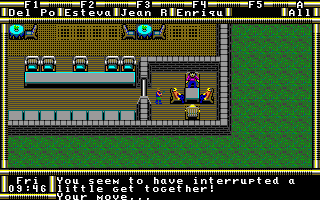 It has a small selection of stores, some NPC houses, a police station, and compounds for each of the game's factions. Some of the latter open up into larger, more detailed maps, much like "dungeons" in a traditional RPG. Within a few minutes of exploration, I'd talked to most of the key NPCs and gotten some information about the various factions. 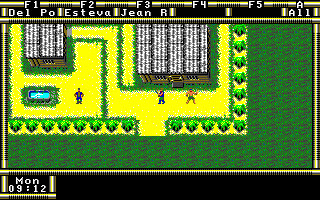 Enemies appear randomly on the street. There aren't many types of them. There are a handful of mutated vermin, like rats, snakes, and spiders, plus hostile members of the factions. The animals run the risk of infecting characters with poison, radiation, and mutation while the humanoid enemies drop loot, so the latter are preferable to the former. Combat is virtually identical to Wasteland--ultimately stemming from a Wizardry heritage by way of The Bard's Tale. Characters line up their actions each round and execute them all at once. Actions include attacking (with separate options for firing single rounds, bursts, and full auto for some weapons), evading, fleeing, using an item, switching weapons, loading and unjamming weapons, or using a skill. As with its predecessor, the character who strikes the killing blow gets the experience, often leading to some leveling imbalances. Combat with a group of Bahia Mafia thugs. Leveling up is fairly rapid, at least for the first five or six levels. Each level-up comes with the ability to add two points to the character's attributes. Most important among these, it seems to me, are aptitude and IQ. The former dictates how far your active skills can develop; the latter governs your passive skills. If I have it right, you can only have as many points in active skills as equals your aptitude minus 15; so a character with an aptitude of 22 can increase his active skills by a total of 7. The same is true with IQ in passive skills. The temptation is to channel all the point increases into these attributes, but other attributes are also important, such as dexterity for dodging attacks and charisma for influencing NPCs. I don't know if strength has value for characters using non-melee weapons except as a backup puzzle-solver. 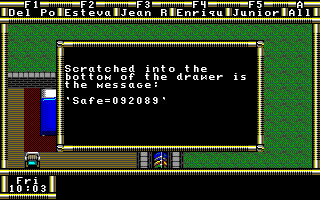 Just like in Wasteland, characters can apply active skills and attributes directly in response to puzzles. A locked door, for instance, might respond to either the strength attribute or use of the lockpick skill. While I like this dynamic, in general I'm finding far fewer places to use it than in Wasteland--but, as in the predecessor, it's also easy to overlook such opportunities. Messages like this pop up as you explore the environment. Some of them trigger ideas for the use of skills or items. Characters start with machetes, leather vests, and .22 pistols and slowly find and purchase better weapons and armor, plus some puzzle-solving items like ropes and electronics kits. Automatic weapons and explosives seem to be the most powerful in this setting. No one comes with automatic weapons skills, but that doesn't stop you from using the guns, and I outfitted my entire party fairly soon after starting the game, thanks to money rewards from quests and combats. Later, I found a skill book that gave everyone the initial passive skill, allowing them to slowly develop after that. As in Wasteland, ammo is a problem. It's in limited supply at shops, and drops of automatic weapon ammo are rare in the world. You can't waste entire clips on full auto without worrying about shortages. Guns also have the unfortunate tendency to jam in combat, and unless the character has a high skill in "gunsmith," he runs a decent chance of destroying the weapon when unjamming it. This is rather unfortunate when it comes to expensive automatic weapons. 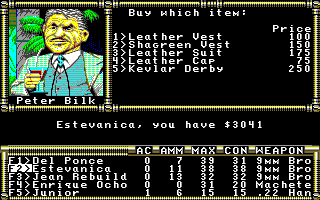 Purchasing armor at the tailor. One persistent annoyance comes from being exposed to "mutagens" which cause mutations in the characters after a few rounds. Such mutations are theoretically beneficial and can be used like skills. One allows you to "shriek" and stun enemies; another allows you to change parts of your body, such as your fingerprints. A passive one, "chameleon," makes you harder to hit. But mutated characters heal at a much slower rate than others (hit points otherwise regenerate quite fast as you walk around), and I've found it's best to cure them as soon as possible. Unfortunately, only the doctor in the starting compound seems to have the ability to cure mutations, and he gets killed (along with the rest of the compound) by Killer Clowns after a few visits. Rum and Dream Water are supposed to ward off the effects of mutation, but I don't think there's any other way to cure it. Overall, it's an odd system. Drinking rum to temporarily ward off mutation. Early in the game, I visited the Miami Police Department and got a quest to seize a rifle shipment from the Bahia Mafia. The police promised my party badges as a reward. They suggested I visit the general store at nighttime, when the mafiosi gather for cards, and tell them "Diz" sent me. It took me a while to figure out that the "general store" is actually the bar, at the south end of town (there is a little general store within it, but the main building is clearly a tavern). Picking the locks at night, I found the mafiosos playing cards. Once I dropped Diz's name, they told me the rifles would be arriving at the mafia headquarters on Tuesday at midnight. In the meantime, I had visited the Bahia Mafia compound and received a quest to kill a local named Almirante Enrique Ochoa and return with his rifle. I didn't have anything against the old guy, so when he suggested that I just take his rifle and give it to the Mafia, I agreed. The Mafia rewarded me with $2,000. When I returned to Ochoa, he agreed to join my party. Later, I returned to the Mafia again and they weren't happy to see Ochoa alive. A major combat ensued and I cleared out their hideout. 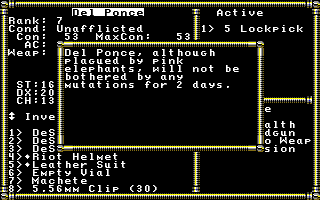 Later, I found out that doing so before intercepting the rifles caused me to fail the MPD quest. My first NPC has an odd sense of humor. Eventually, the accumulation of bad leveling decisions and bollixed quests led me to abandon my initial party and start anew. 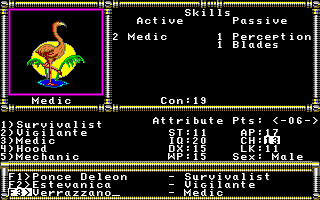 Knowing that Ochoa had the "hood" skills I needed, I made my second party a vigilante, a survivalist, and a medic. 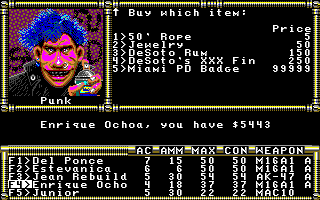 Things progressed much as in the first party except that I delayed wiping out the Bahia Mafia headquarters until the guns had arrived, thus satisfying the Miami Police quest and getting my characters their badges. In the time I spent waiting for Tuesday, I grinded my characters on random encouners with OhOhs and Beachcombers, getting everyone up to Level 7 or 8. The MPD sent me on the next quest to disable the DeSoto Family's rum-manufacturing capabilities. The DeSoto compound was fairly large, with several sub-areas. A group of houses for the DeSoto family had a bunch of weird encounters. One of them, belonging to the son, Mario, was full of stuffed corpses. Another had a woman named Imelda who seemed to hate her family, but I couldn't get anything out of her. Several buildings had rewards of cash and ammo in drawers, including one where I had to find a combination in one building before opening a safe in another. Throughout, there were random combats with animals and DeSoto guards. The conclusion to the quest came when I found the distillery and used my "mechanic" skill to destroy it. Some papers indicated that the DeSoto rum had a special ingredient called "Agua del Cielo," somehow related to the Fountain of Dreams, and picking a lock on a vault revealed a few bottles of the water. 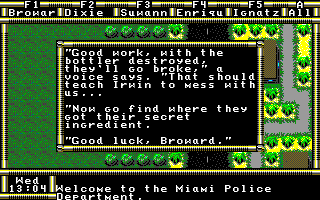 When I returned to the Miami PD, I was congratulated and given another quest to "find where they got their secret ingredient." I'm not sure how to do that, and I'm wondering if I missed something in the DeSoto compound. Unfortunately, at this point, I'm out of ideas for what to do next. The only building I haven't explored is (I think) the Clown Kollege outside of Miami. Every time I try to approach the building, I get attacked by mortar fire and my entire party is wiped out. I'm not sure if I need something to avoid this fire or just grind until I have enough hit points to withstand it. Hints are welcome. In the meantime, I'll re-check every building and NPC for clues. The game auto-saves every time you switch areas and at key plot points, making it essentially impossible to try more than one path or to undo unfortunate occurrences. There are several places that you can store excess PCs or NPCs. I don't really see any purpose to doing so, however. It seems to make more sense just to keep developing a consistent party. Unless I have something configured incorrectly, there is no sound in the game except a beeping at the onset of combat. 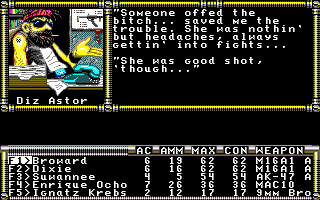 Drinking rum--one of the only ways to fend off the effects of mutation--causes the game to display a "Hic!" and causes the party to stagger in a random direction every few rounds. I think it was Ultima IV that did this first. The "general store" sells Miami PD badges for $99,999. They're the most expensive item in the game, and it's hard to imagine ever having enough to buy one. The founder of the Killer Clowns is named "Kermit," according to the manual. This already isn't very funny, but it's particularly unfunny when you realize that the Muppets had no connection to Disney in 1990. In at least one area, the game does a good job with continuity. 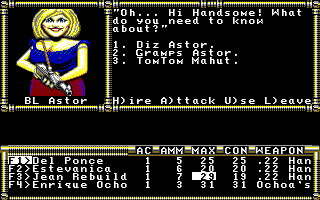 For a while, I had an NPC with me named "BL Astor," a gun-loving woman estranged from her husband, the local gunshop owner. She joined me when I gave her some perfume I found in the OhOh's compound. With her in the party, the gunshop refused to let me in. Later, she died in combat, and when I spoke to her husband, he acknowledged her death. 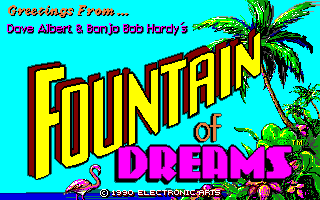 Fountain of Dreams is a mediocre game, no question, but it's not quite the travesty that I anticipated from past comments. The areas serve up some interesting NPCs and encounters, skill development is reasonably rewarding, and it moves along at a decent clip. I don't expect more than a couple of postings out of it, but it was a decent way to ease me back into playing and blogging. Thanks for sharing your adventures with us. Keep up the good work. For our German (and other foreign) friends: the KKK is a notorious American racist terrorist organization dating back to the Civil War. They're pretty dead now, but back in the 80s were still kind of kicking. Fair enough. They could have worked that into the story, though. The Klowns take "white pride" so literally, they actually dress up in whiteface. I wonder what they will do with the factions in Boston, in Fallout 4? Are there any cool divisions in Boston they could use? Feral MIT students? I don't know about "cool" but there are a few rather well-known gangs in Boston. For instance, the Hispanic Mara Salvatrucha, the Irish Winter Hill, the Asian Boyz (also active in other states and founded in California). There's also the X-Men, those damned mutants. They'll probably avoid gangs based on ethnicity. Bethesda seems to play it pretty safe on those lines. I'm curious how much territory the game will encompass. If it's as big as the Mojave wasteland, they could do some fun things with Wiccans up in Salem. If it goes as far south as Hingham, they'll have erected a wall around the community and continued to live in post-apocalyptic isolation. Of course, the most unrealistic thing that could happen in the game is for the same character to cross from the south shore to the north shore. Even 200 years after the apocalypse, that stretches credibility. Oh, and if they don't have a proliferation of Dunkin' Donuts or some obvious stand-in, they'll have missed a huge opportunity. There ought to be one literally visible at all times. Are there really that many? That's like Starbucks in the northwest. 1. This is how you estimate travel times: Once, on a Sunday, You left for work at 07:44, which is basically 08:00. You got there at 08:47, which is basically 08:30. Ergo, it takes you 30 minutes to get to work. 2. You live within 5 miles of 7 Dunkin' Donuts--no, 8! You forgot the one in the Stop & Shop. Beyond that, there are a lot of divisions in the state based on city, neighborhood, and ethnicity. It would be fun if Fallout 4 juggled all that, but unlikely. Welcome back, Addict! I expected your return about 10 days ago, because that's when I also resumed gaming after a forced 5-month break (Throne of Bhaal, Sendai is dead, now in Watcher's Keep...). Indeed, the details of New Vegas are lovely, though I was most interested in the biography of Howard Hughes who, of course, was the inspiration for Mr. House. About this game, I guess they tried to build a game upon regional stereotypes. I think New Orleans would provide a better background. There, you could go full voodoo instead of beachcombers. There's a place for this kind of story-telling. 50 years after an apocalypse, how WOULD certain groups have adapted? I find it entirely plausible that there would be remnants of organized crime, cultural groups. Florida survivalists would have a heyday. Killer Clowns aside, there's a nucleus of a good idea here--they just seriously bungled the execution. Yes, the game world is really small: You see the city of Miami, which has less surface area than a football field? That is more or less the entire game world, and the goal of the game is only 20 steps from the beginning. 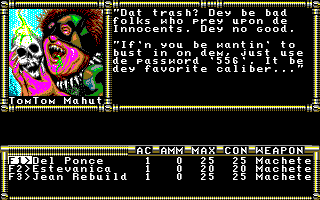 This game is based entirely on dealing with a war between gangs of stereotypes in an area smaller than the average suburb. Getting drunk has the same effect as getting shroomed in Earthbound. Unfortunately, getting shroomed was involuntary. I hate confusion: It causes your characters to wander in random directions and kill each other through no fault of your own. I know you hat poison, but that rarely has a significant effect-confusion is much worse. 'BL Astor', 'Diz Astor'? Awful. I guess context is always going to matter when looking for the best or worst thing. A game released by a significant publisher as a successor to one of the most popular RPGs of its time will be judged more harshly than two undergrads coding up an obvious knock-off. If The Phantom Menace hadn't been a star wars film, it wouldn't have the same reputation. But yeah, I'd guess they thought of having K for Klown, but someone realized where they'd be sending the player. I had forgotten about this film entirely. You're right that there's an obvious inspiration here. Ha! Thanks for linking this. I had no idea. It's not quite in the right place on the map, but then neither are the Everglades. Great to see you back from your break Chet, I hoped that you enjoyed it. This post reinforces how much I missed your blog over the last couple of months, a great piece about an interesting but flawed game that I had never heard of before. You should read his previous post. The magenta in the shot of the woman being kidnapped makes it look like her rib cage is showing. May all 80's surfer dudes diligently protect us from undead beach floozies. Welcome back. I'm looking forward to your next post so make it quick. Makes me feel like playing it. I still have the original boxed 5.1/4 PC version and never installed it! Is there some reference making the names "Tockett and Crubbs" especially silly? I feel like I'm missing something. Miami Vice, a television series that was very popular in the 80's, featured two characters that were trendy, no nonsense cops name Crockett and Tubbs. I think the game made a desperate attempt at humour by making that reference. You got me curious about state of Hard Nova and what is causing the block. Myself spotted the said old game box at storage couple weeks ago among few others and leafed through manual. I don't remember the game as that hard, but maybe time has gilded memories. Good to see you back; hope the trip was excellent. I would've expected Fountain of Drams to have a stellar reputation among whisk(e)y fans, though -- including Chet. Looks like the "Diz" you were claiming to have been sent by for the rifle shipment info is the owner of the gun shop. Yes, and the husband of BL Astor. There are a lot of cross-connections like that. That's one reason I despise these 80s silly themes. "Killer clowns LOL! It's the last thing you would ever expect!" They started with a premise like that, and then just went nowhere with it. The story makes no sense and just darts around randomly. Why? Because there isn't really anywhere TO go with something like that. It's a one-shot gag. It doesn't work when you stretch it out to the length of a 20 hour RPG. 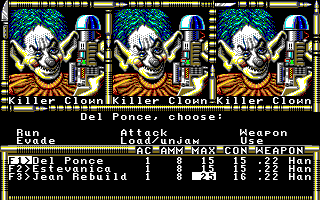 Killer Klowns are a nasty monster in the roguelike Dungeon Crawl, too. I just looked up the Crawl wiki, and it says: "Killer Klowns were originally murderous extraterrestrial pranksters in the 1988 Academy Award® winning comedy horror sci-fi film, Killer Klowns from Outer Space." It was also a common cultural meme at the time. The movie just put it into motion pictures, the concept had existed for some time. The clown college founder is another pun, or at least, another reference to a famous character or person with the name inverted: Kermit Eli = Emmett Kelly, who was a famous clown in the 1940s and 50s. hmmmm...... this game bears some resemblance to the original fallout. 1) you start in a sheltered area (vault/village). 2) a computer chip responsible for the water recycling and pumping machinery of the vault, malfunctions. you have a limited time before the water reserves runs dry. in this game, dream water is getting harder to come by. i have not played fallout 1, but i know a little about it. as such, there may be more connections, but i dont know. of course, this game is a "successor" of sorts to wasteland and fallout is a spiritual successor of wasteland, so some similarities will occur. i just thought the water situation at the start of this game was very similar to the water chip problem at the start of fallout. I haven't played the original Fallout, so I didn't know that. Thanks for the comparison! I look forward to seeing the similarities for myself in a few years.